Wooden bridges remain pretty common in the day and age of high technological gadgets, space travel, and modern construction. Some wooden bridges are used because it’s all the county or local community can afford. They keep the one they have. Others are maintained due to the desire to preserve the history associated with it. Regardless of the reason, trail horses need to be ready to cross a wooden bridge and not get excited in the process. Like anything new, some horses don’t like the sound or the give underneath their feet. The bridge just doesn’t feel natural and solid. The practice and repetition of going across them makes it easier when the need arises. The video shows a couple of our horses, Doc and Speck, crossing a small training bridge we use. The little bridge was built from logs with boards screwed into the logs to replicate a wooden bridge without the expense. You may notice it isn’t level and the boards have some slope and tilt to them. We aren’t carpenters or bridge builders, but even we have more ability than what you see in the video. The bridge was constructed deliberately uneven and the boards allowed to follow the natural curves in the logs laying on the ground. This was done to make it even less appealing to the horse with the uneven surface and because we are lazy. The bridge was built for training purposes and there was no reason to spend a lot of time and effort. It serves the purpose of giving the horse a wooden bridge that is narrow and gives a feeling of instability; a good way to see if the horse trusts you enough to cross it anyway. Training tools don’t have to be expensive. It is nice to have them reasonably safe. Here the bridge isn’t very high off the ground in order for young horses to step off the side or do something silly without getting hurt. One of the youngsters walked across it the first time with his hind feet on the ground and his front feet on the bridge. It was an acceptable first attempt for a colt and he came back to it later in the week to do a real good job. The training bridge is just one more tool we use with the horses in our training program for trail horses. We host interns from the equine colleges during the Summer months and give them some real riding experience to supplement the classroom studies they are taking. 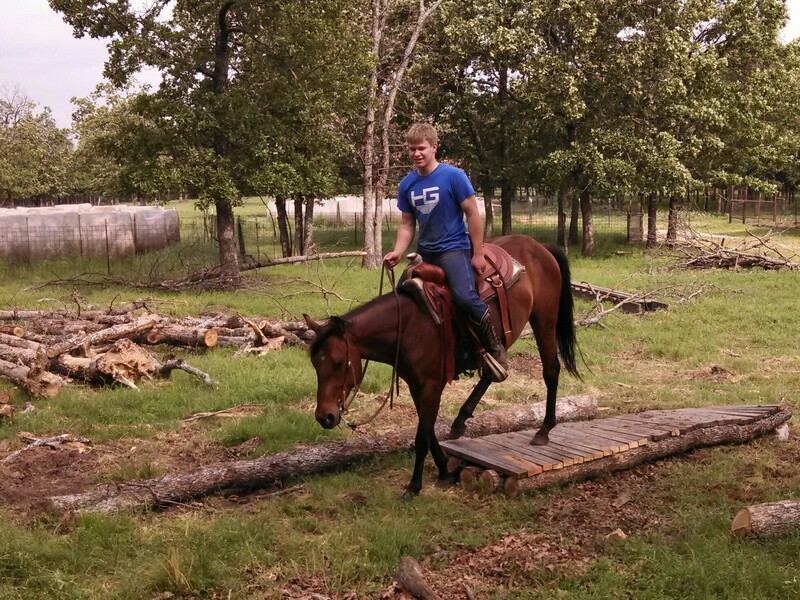 Dallas, a Oklahoma State University student, rode Doc at the City Slickers trail ride and had a great time. The young people in the internship program work really hard during the internship and learn a lot of new skills. Many work full-time jobs while participating in the program on weekends and whenever they can fit in the time. Although it is a lot of extra effort on their part, you can tell they love it. We asked Dallas to ride Doc on this trail ride because he is quiet and doesn’t get excited. Dallas had worked the night shift the evening before. She came straight from work and went to the trail ride. Riding Doc seemed the smart thing to do when she hadn’t slept all night and was headed out on the trail. Doc and she get along really well and had a great time. The real life experience with horses gives these students a big boost when it comes time to find a job. They leave the internship with horse handling skills you just don’t get reading a book. They also develop a lot of self-confidence with the knowledge that comes from actually working with horses in a ranch environment beside a professional trainer. The wild fires in Bixby, Oklahoma are especially concerning with the ongoing drought. This week the fires were particularly close and the horses were put to use to keep an eye on the fires. The fire departments in the area do a great job, but they are overworked with fires. Sometimes in a rural area, the fire department just lets the fires burn themselves out if no danger is posed. However, the strong winds this week constantly shifting direction meant a safe condition could have turned dangerous with little or no warning. Since the fire department initially planned for the fires to burn out rather than extinguish them, someone needed to help keep an eye on the situation. Without sufficient man power to post a fireman to do the job, Shawn did his best to monitor the fires from horse back. One advantage to horses is the terrain. The area is rough, rocky, and hard to transverse. The horses work in this environment everyday so it was just another day at the office for them. The horse in the News on 6 video is Doc. We are pleased to be able to use the training our horses receive to support our community and help take care of our neighbors. We also deeply appreciate the dedication and hard work of all the firefighters who selflessly fight these fires. Recently we were riding when Doc got stuck in the mud and we were really pleased to see how he handled getting out. Doc had been ridden into the water to get a drink and sank down on his front feet. Sensing a good opportunity to practice, he was asked to back up. We like a horse to be ready to slowly back out of an uncomfortable situation without getting real excited. Unexpectedly, his back feet slipped and left him up to his back hocks in the mud. The left rear leg sunk a little deeper causing him to twist. Front feet stuck and hind legs slipping under him is the kind of event that can turn real ugly really fast if your horse gets overly excited. As soon as he slipped, he was asked to ” Whoa. ” He stood still and waited for the next que. Contrary to what probably felt safe to him, he was asked to go forward a little. To Doc, it likely seemed just the opposite of what needed to happen, but he calmly stepped forward breaking his front feet loose. He was then allowed to turn around to climb back to dry ground. We were really pleased. He kept his head about him, maintained his training, and dealt with it like a trail horse should. Like we constantly repeat, you can’t plan for every contingency. Things happen sometimes and they happen fast. An experienced trail horse will work through it safely if allowed to do so. 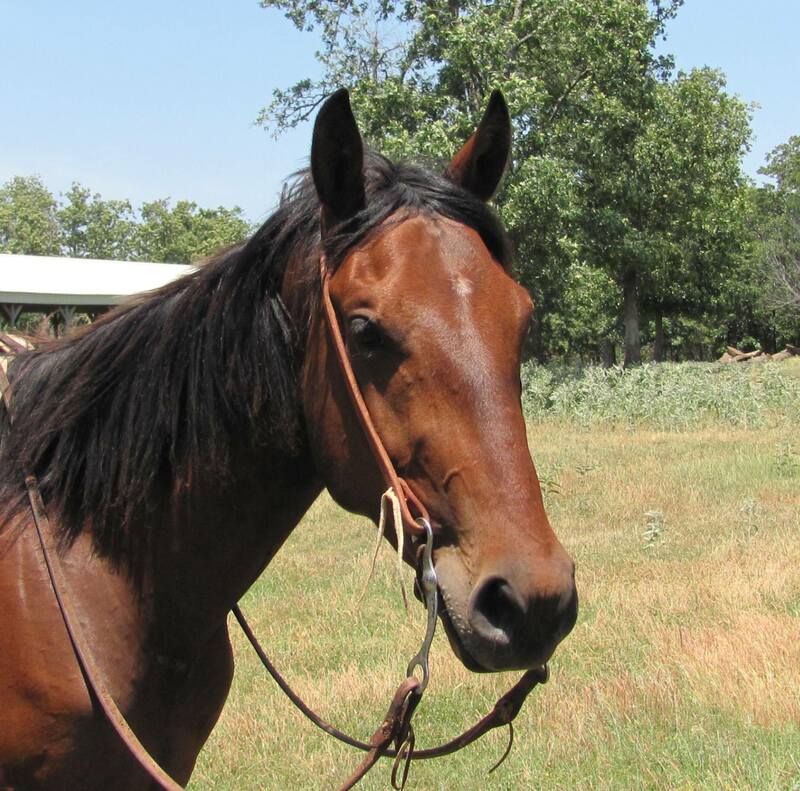 Doc is an AQHA registered gelding one year through the two year program and doing wonderfully. He in incredibly calm and relaxed with pretty much everything. With a keen mind and good attitude, Doc will attempt to tackle any task willingly. One of the outstanding attributes of the American Quarter Horse is the ability to remain relaxed in exciting situations without losing the intensity to get the job done. Click here to check out what Doc has been up to! You are currently browsing the archives for the Meet Doc category.